This tip applies to Outlook 2003, Outlook 2007, Outlook 2010, and Outlook 2013. The names and locations of the ribbon / menu items may have changed with different versions but the ability to create a custom column and view applies to all versions of Outlook starting with at least Outlook 2003. The images in this note are from Outlook 2010. Over the years, I have looked at several different interfaces to email. For whatever reasons, none has been the one for me. Currently, I use Outlook if I have access to one of my own computers and Gmail if not. Two Outlook customizations affect how it displays the name of the person in the email conversation and the format of the date of an email. My current display includes two custom columns as in Figure 1. The first, labeled FromTo, shows the name of the sender for incoming emails and the name of the recipient with a leading ‘-> serving as an outbound icon for outgoing mails. 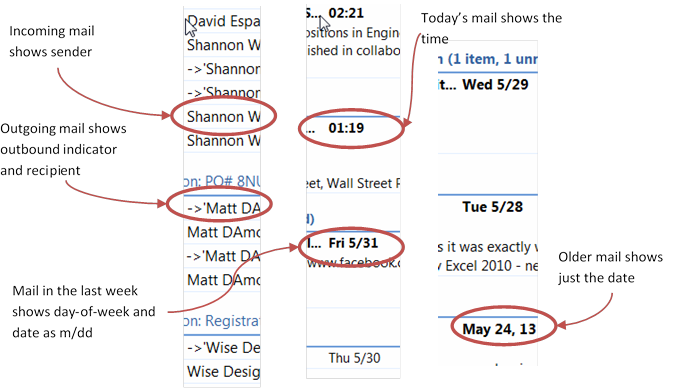 The second custom column, labeled DateDayTimeTime, shows timestamp of the email in three possible formats. For today’s emails, it is the time (hh:mm). For emails in the past week, it is Day-of-week and the month and date (ddd m/d). For even earlier emails it is month date and year (mmm dd, yy). All other emails show the month, date, and year. Thank you thank you. This fixed a major annoyance for me, and you’re absolutely right – how Outlook’s designers didn’t go through the same process you’ve outlined is ridiculous and a bit saddening. You rock.